I've always loved to taste the Pinot's from this estate because of their commitment to delivering classic Pinot Noir in a style that I believe perfectly represents what the Carneros appellation is all about. It's cool weather Pinot Noir that delivers a great purity and clarity, and demonstrates great balance between fruit and acidity. I fondly remember tasting several aged Pinot's from this winery as well, and I can tell you that they age like some of the finest Burgundies. 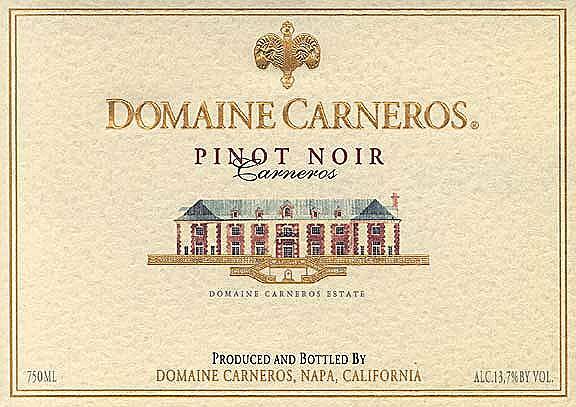 The 2008 Domaine Carneros Pinot Noir was made from 100% estate-grown fruit from vineyards located in the Carneros appellation. It was aged for ten months in French oak and then held back in bottle for an additional ten months prior to release. The color of this wine is lighter-hued and is exactly what I expected before opening this bottle. That is, a wine made in a traditional style, devoid of any manipulation and over-extraction. On the palate the wine has a very old world style texture, but at the same time it shows the California sunshine in it's ripe fruit flavors. By "old world" I speak of focused acidity and the absence of any fattiness or gloppy weight caused from access barrel toast or heavy tampering. The wine tastes fresh and straight from the vineyard.